Viewing topic "Creating a Performance from scratch !!!" Hello, I have my XF form a few month and I started creating Performaces o my own. I Followed many tutorials and helped me a lot. The only thing that not understand is how to put a Drum arpegio into my own performances. I know how to assign an arpeggio and select the corresponding DrumKit. My goal is to make a performance with for example a Drum part, bass, synth and lead (total of 4 parts). OK. But to trouble is with the Drumpart and the arpeggio. When I select the performace i just created, the first time I hit a key all works ok (the arpeggio for the drumpart starts to play), but when i hit other keys i dont want that the each part of the drumkit sounds every time i hit a key. Practically all the Performances in the XF that uses Drumpart and arpeggio, when I hit any key the firsttime, the drumpart starts its arpeggio but when I hit other keys, the individual part of the drumkit does not sound. This is my goal. When you assign a PART (like your drums) to an arpeggio, correctly, it will no longer sound when you press each KEY as you play. An arpeggio PART typically plays the arp pattern or what you play (not both) So we believe that you are mistaken about this. Are you sure you are hearing a drum from each key? - or are you hearing just a CRASH CYMBAL? If you have this parameter set to 64, for example, you will hear a CRASH Cymbal any time your Velocity exceeds a value of 64 (if you would rather not have a CRASH Cymbal every time you exceed 64 - either set this to a value that you do want to trigger the CRASH, or turn it to OFF. Now I know how to assign arp patterns to Drumkits the way I want. 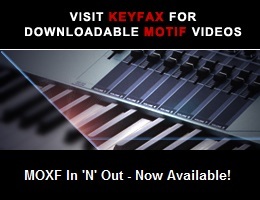 How do I create new performances from scratch using new user arps on my Motif XS6.? Where are my user arps stored after putting tracks to arp as shown on “world of motif” DVD. I can’t seem to find them. My aim is to make new performances using 4 four voices (or more) with Drums, bass, synth and lead. Since there are only 4 parts (voices) to a performance,Can I edit (overdub) existing preset drum kits in performance mode e.g. "Pop Latin Kit” to add a cowbell or conga sound? User Arps are found in the USR Arp bank. Presuming you correctly created a User Arp, change the Arp bank from PRE (Preset) to USR to find your Arp. A Preset Drum Kit can be edited and stored in the USER DR bank. Then use that kit in your Performance.